« Welcome to the Sock Hop! It’s Be-Bop-A Blog Hop WEDNESDAY, Daddy-O for September 7th! Since Apple has pretty much taken over the musical world, very few people now are living without an iPod or iPhone of some kind. I have to admit that I was one of the last ones to convert, but since buying an iPod, I don't see myself ever going back to anything else. Of course, now I need a great way to play my tunes anywhere in the house or even while traveling. This is where KICKER Performance Audio comes in. They've designed several innovative docking systems specifically for the iPhone or iPod. Recently, I had the chance to review the iKICK100 Compact Docking System and EB91 MicroFit In-Ear Monitors. Keep reading to learn more! I reviewed the iKICK100 iPhone/iPod Dock from KICKER, which retails for $149.95, but is currently on sale for $129.95 with FREE SHIPPING. I also reviewed the EB91 MicroFit In-Ear Monitors from KICKER, which retail for $34.95, but are currently on sale for $32.95 with FREE SHIPPING. 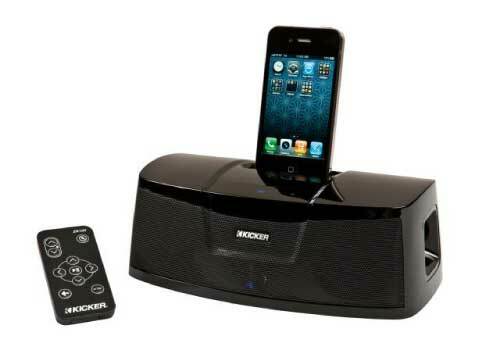 The iKick100 Compact Docking System for iPod and iPhone comes with the same intense sonic resolution of other KICKER docks, but in a less imposing package. Despite its smaller size, the trademark elevated volume level remains. The iKick100 sets itself apart from the mainstream by utilizing a bass-activating, flared-port design for extended low frequency output, as well as a DSP-controlled amplifier tuned for maximum output potential and premium sound. 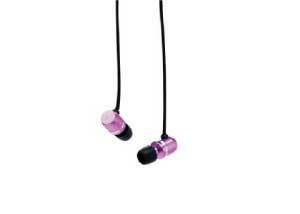 The Bass Activator helps in making the iKick100 stand alone as a superior audio piece for confined spaces. With dual speakers positioned for wide stereo imaging in factory listening tests, the brick-sized KICKER dock is sure to produce the clearest and cleanest sound that’s perfect for any office desk, night stand or coffee table. The iKick100 has a backlit, capacitive-touch screen for volume control. A single touch can increase or decrease the volume level depending on the listener’s environment. An auxiliary-input jack for connecting additional media players, computers or satellite radio is also controlled by the touch screen located on top of the dock. The stylish black dock fits into the smallest places of any room, where the listener can turn up the volume with a lightweight, full-function remote control that handles any adjustments the user requests. An adjustable rear support attachment keeps 4G iPhones and 4th generation-or-newer iPods stable while they’re docked, and a handy USB port is available to keep cell phones and other external devices charged. An AC power cord and external 12-volt power supply are also included, making it possible to keep rocking throughout the day. I have to admit that I had mixed feelings about the iKICK100 for I loved the extremely small, compact design and sleek, minimalistic look. It's also extremely easy to operate, for you only have the power button, auxiliary button and volume buttons to worry about. There are no knobs available for adjusting the bass or treble or any other audio setting. The iKICK100 also has the ability to wear any one of a multitude of snazzy skins which can transform it into an instant conversation piece. I loved the remote control as well as how this compact iPhone/iPod dock could easily be used in any room in the house. So far, we've used the iKICK100 in the kitchen, bedroom, bathroom and garage and what's more, this small, unassuming sound system can play your tunes LOUD, which was quite unexpected due to its tiny stature. Unfortunately, what I didn't particularly care for about the iKICK100 was its overall sound. You see, the speaker bar in the front puts out primarily treble, while the thumping bass is delivered through the KICKER BassActivator on the side. In order to get a better blend of sounds, you need to have the unit turned at about a 45 degree angle to your ear. This way, you're not overrun with the tinny, high sounds of the treble, and yet not overpowered by the bass alone. I was a little surprised by this, for I thought that the unit should be facing you directly, but it definitely did not deliver the best audio that way. Next, I was a little disappointed that I had no control over the audio. I would like to be able to adjust the treble and bass volumes, for everyone's tastes in what they like differ slightly when it comes to treble/bass amounts. Finally, I heard several instances of static or crackling noises while listening to my music, though I'm not sure this is due to the design of the iKICK100. When I removed this compact dock system from its box, I could hear a loose screw of some sort rattling around inside. This unattached component could be to blame for the static that was heard from time to time. I also had the chance to review the EB91 MicroFit In-Ear Monitors and have to admit that I absolutely LOVED these ear buds! The KICKER EB91 MicroFit In-Ear Monitors make extended wear of audio plugs more enjoyable than ever with even more choices of tips to fit the smallest ear canals. EB91s also come with average-sized tips for an ultra-comfortable seal in any ear size, while still delivering noise-isolating, premium full-range sound and legendary KICKER bass response. KICKER research has shown that ear canals range in various sizes, and EB91 MicroFit In-Ear Monitors were specifically created with this in mind. Its aluminum monitor housing is 33 percent smaller than standard in-ear monitors, making for the most lightweight and comfortable plugs available. This perfect fit, using four sizes of super-soft silicone tips and impedance-aligned, 8-millimeter micro drivers tuned for exceptional sonic performance, ensures any lengthy music-listening session is always a comfortable one. The are available in four stylish colors: gold, silver, black or pink, and are my new workout must-have for when I go to the gym, take a walk or run around the neighborhood or bike ride through the park. I used to hate wearing this style of headphones, but now I can honestly say that I love wearing these. The sound is superb and the fit is extremely comfortable! Disclosure: I received the iKICK100 iPhone/iPod Dock and EB91 MicroFit In-Ear Monitors from KICKER in order to facilitate my review. No other compensation was received. This product review is based on my own personal experiences with this item and is completely honest and objective.